Home » Angel Numbers » Angel Number 0: Are You Seeing 0? Find Out The Truth! Numbers are more powerful than many people realize. But what is the spiritual meaning of angel number 0? Well, the numbers are a crucial tool in the spiritual realm, and they are often used by spiritual leaders, otherwise known as guardian angels, to communicate with the material world. Every angel number or numerical combination holds a unique meaning. Our angels then show us this message through the physical world. We might see the message on the clock, or a receipt. By understanding the meaning these numbers hold, we can get an understanding of our paths from the spiritual powers. Truly, our connection to the spiritual realm is integral to our existence. To understand our connection to the universal powers, we can tune in to the messages our guardian angels send us. Angel Numbers can increase our awareness of universal energies. Free angel number reading provides us with a better understanding of the link between the material and spiritual worlds. Having a clearer comprehension of this will allow you a greater understanding of your place. Similarly, it tells how you can pursue your true happiness. At times it is useful to tune into the spiritual world. This is especially true when you see the number zero often. Angel Number 0 symbolizes the connection between all living things. Because 0 is an infinite symbol, Angel Number 0 is often considered to be a symbol of eternity. This number draws your attention to the spiritual world. You ought to seek out a “god force” during this time. What Does Angel Number 0 Mean? Angel Number 0 is thought to symbolize the beginning of a spiritual journey. It is through the idea of growing your connection to the universal energies that you can start afresh. 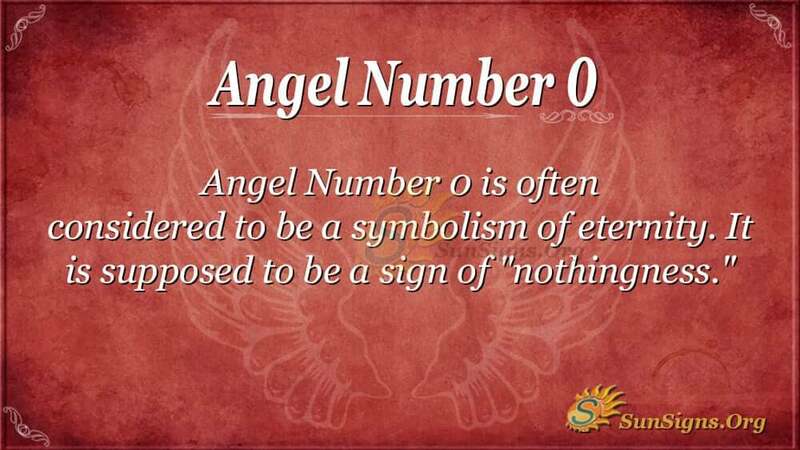 Angel Number 0 is also considered to be a sign of “nothingness.” It denotes the beginning of a new phase in your life. It is time to leave behind all worries and inhibitions and begin again. This new phase in your life will without a doubt be challenging. Uncertainty and big decisions encompass this phase. However, being aware of the messages your angels are sending to you is the first step to understanding your destiny. They want you to know that they are behind you, and they are there to guide and support you. During this time, it is essential to remember that Angel Number 0 is drawing you to the divine world. Let earthly concerns fall away and focus heavily on this realm. With your increased closeness to the spiritual realm, you will have a heightened understanding of yourself. Hence, you will better understand your direction and should feel more confident in trusting your judgment. What Is The Spiritual Meaning of 0? It might not be easy to start over. You might face challenging times, but won’t be alone. It is important to retain a sense of your place and how it relates to the spiritual realm. It will help you to see yourself as part of a network. Certainly, it helps in understanding the connection between all things. Also, it tells what your role will be. This is the beginning of a spiritual awakening. Accordingly, don’t be afraid to take on this journey, and know that you won’t be facing it alone. You are closer to the spiritual world than ever before, so listen to the voice inside that guides you. Next Angel Number 1 – Why Am I Seeing This Number?